The Cooper Union and its renowned auditorium, The Great Hall, have been the setting of pivotal moments in American electoral history. In fact, The Cooper Union has become so central to American political life, that nine presidents spoke here, most before their election to the presidency. 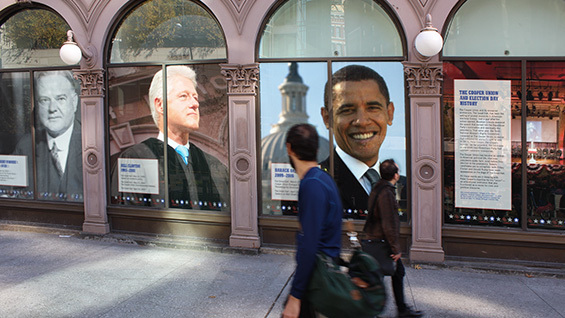 To mark the role of the school in presidential elections past, a set of posters were hung in the colonnade windows showing important election-related events that took place at Cooper as well as the nine presidents themselves. Just a year after the school opened, Abraham Lincoln delivered the speech that earned him the Republican Party’s nomination and eventually the presidency. That same year, the Tenth National Women’s Rights Convention convened at The Cooper Union, a caucus that militated for women’s right to vote. In 1876, Peter Cooper, the school’s founder, ran for president, the candidate of the short-lived Greenback Party that opposed corporate monopolies. All these events, described in more detail below, are in keeping with Peter Cooper’s objective for his “union” — a school providing a top-flight education that functioned as the center for civic and political discourse. The speech, commonly known as the Cooper Union Address, so effectively persuaded Lincoln’s audience that his political fortunes immediately changed, transforming his reputation as a mere “pioneer lawyer” to an astute, charismatic leader. In 1876, in the midst of a recession, Peter Cooper, industrialist, philanthropist and founder of The Cooper Union, ran for president of the United States as the first candidate of the Greenback Party. Though he had little hope of being elected, the 85-year-old Cooper accepted the candidacy to give credence to the Party, which was founded to combat post-Civil War inflation as well as the growing number of corporate monopolies. Its name came from the money issued to Union soldiers by the federal government during the Civil War, a currency not backed by a gold standard, and after the war worthless currency. Cooper received little support for his effort to monetize Greenbacks, and that year’s election was won by Rutherford B. Hayes. The Great Hall was the site of the Tenth National Woman's Rights Convention on May 10 and 11, 1860. Attended by the likes of Elizabeth Cady Stanton and Susan B. Anthony, the convention occurred soon after New York state declared that, in divorce, women could be granted joint custody of their children and were the sole owners of their property and wages. The conventioneers strategized on ways to give women full legal protections and rights, including the right to a trial by a jury of her peers and the right to vote. At the convention, Elizabeth Cady Stanton laid bare the strict limitations marking the boundaries of women’s lives: "Can a woman be said to have a right to life if all means of self-protection are denied her…? Can she be said to have a right to liberty, when another citizen may have the legal custody of her person …? Can any citizen be said to have the right to the pursuit of happiness, whose inalienable rights are denied; who is disenfranchised from all the privileges of citizenship…?" On April 22, 1912, after the New York legislature failed to grant women the right to vote, the Wage Earner’s Suffrage League staged a rally at The Cooper Union comprised of thousands of working women demanding suffrage. They wouldn’t receive that right until 1917 when women got the vote in New York, three years before the 19th amendment to the U.S. Constitution.